Your "weirdness" is what makes you interesting. Look it in the eye, tell it you love it, and give it a hug. I'm as nerdy as it gets. My favorite TV show is Buffy, I love Batman comic books, and I have a really big crush on Veronica Mars. I am a huge fan of heavy metal. But when I go to heavy metal concerts, I typically wear warm colors (because I prefer them), but that makes me stand out like a needle in a haystack since 99% of the people who go to these events are inevitably dressed in black (this isn't meant to be a criticism or judgment of any kind, just an honest observation based on my experience). My music taste is all over the place. In addition to the heavy stuff, I also enjoy some pop and rap (Pink is my favorite artist at the moment -- I have been listening to "The Truth About Love" on repeat for the last month). I make up silly songs while driving around town. The lyrics usually involve things like a delicious sandwich I ate for lunch, a ridiculous thing my dog did, or a cute female I saw at the coffee shop (and may or may not have a really big crush on). My favorite movie is "Mean Girls." Also, I have a serious word vomit problem. I just blurt things out without even thinking about it... it's REALLY bad. Anyone else know that feeling? I have an irrational fear of bees, wasps, hornets, (anything that buzzes). I have never been stung*, so I freak out if one gets within twenty feet of my current position. One time, a bee flew through my car on a summer day. I panicked, lost control of my vehicle, and came inches away from driving into a stop sign (and then I laughed at myself for a minute or two). Finally, we have reached the point. Your "weirdness" is what makes you who you are. Don't be ashamed of the body that is yours alone -- the quirks that make you an interesting person -- or the individual characteristics that define who you are. *A couple years later, I did get stung by a bee for the first time in my life during a hike in August of 2015. It did not hurt nearly as much as anticipated. And I didn't have a panic attack (thanks yoga). 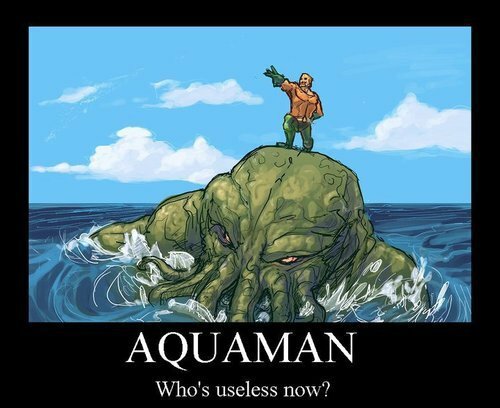 "Aquaman is stupid, he just talks to fish... how's he going to be of any use?" 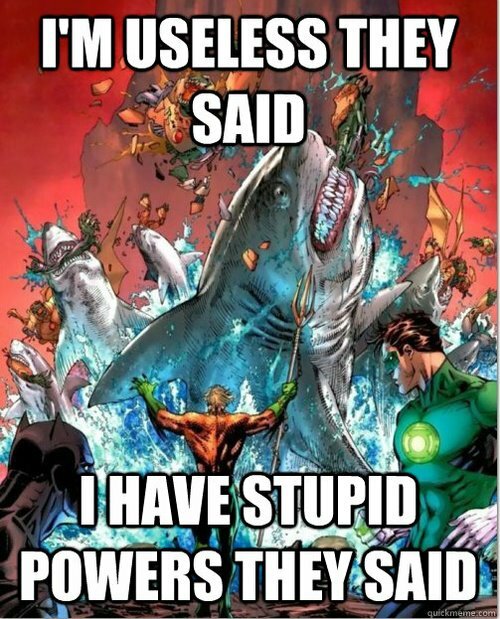 Aquaman doesn't give a crap when other superheroes bully him, because he knows how powerful he really is. Superman patrols Metropolis. Batman patrols Gotham City. Spider-Man patrols NYC. Aquaman patrols the OCEAN. Aquaman talks to fish. So what? If the Joker ever decided to poison the nation's water system with laughing gas, I bet Batman would come running for help... am I right? Click here to join the "Do Yoga Every Damn Day" waiting list (bonus: download a preview chapter in an instant).